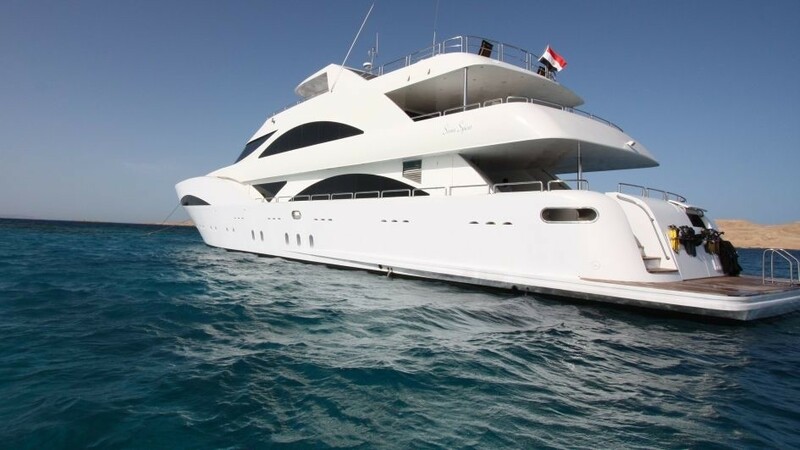 Motor Yacht SEVEN SPICES is a luxurious 40-metre charter yacht based in Egypt and has fantastic water toys and full scuba diving equipment. 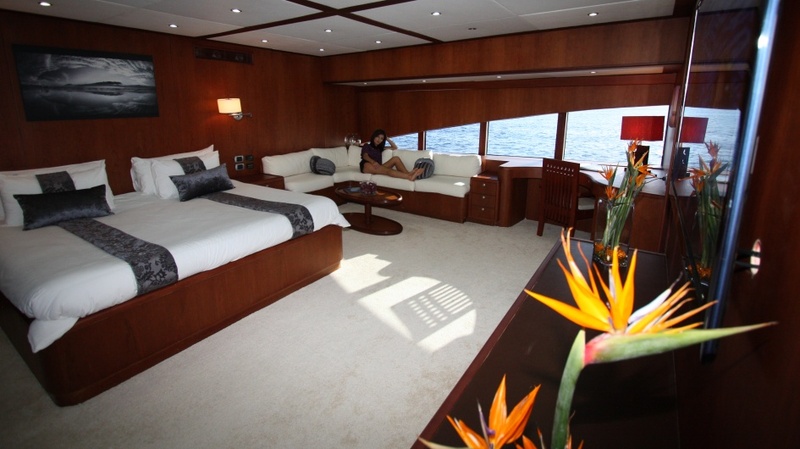 She offers accommodation to 13 guests in 6 stunning and comfortable suites. 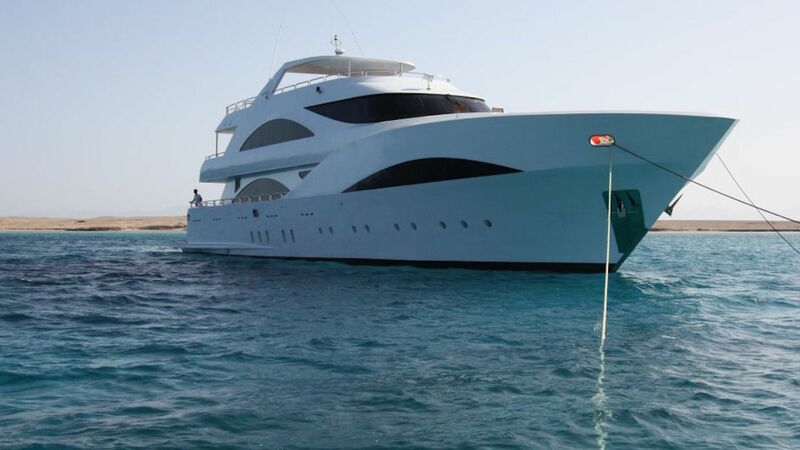 She was launched in 2011. 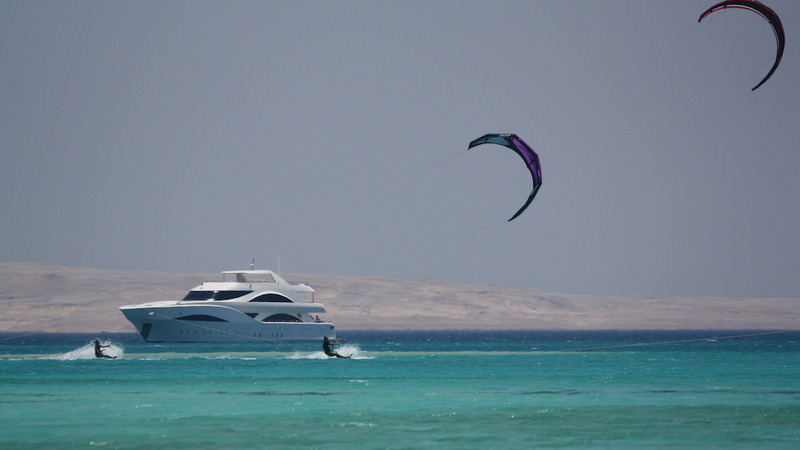 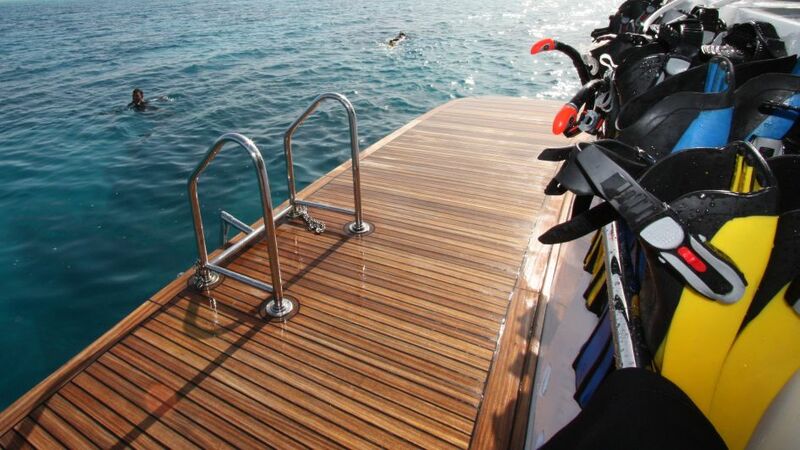 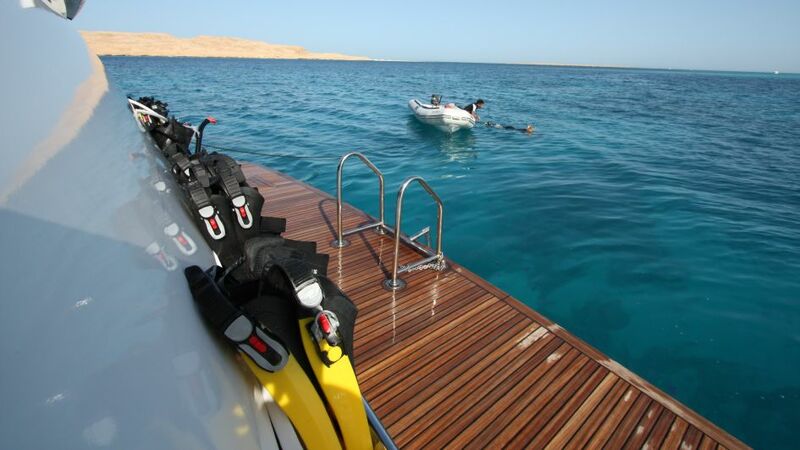 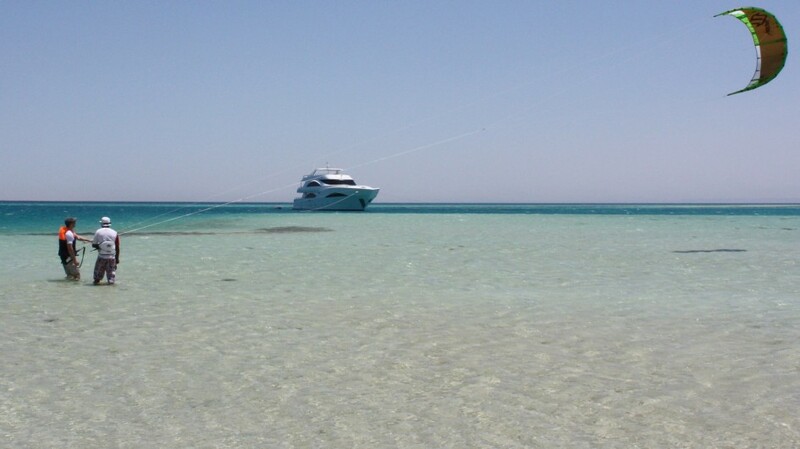 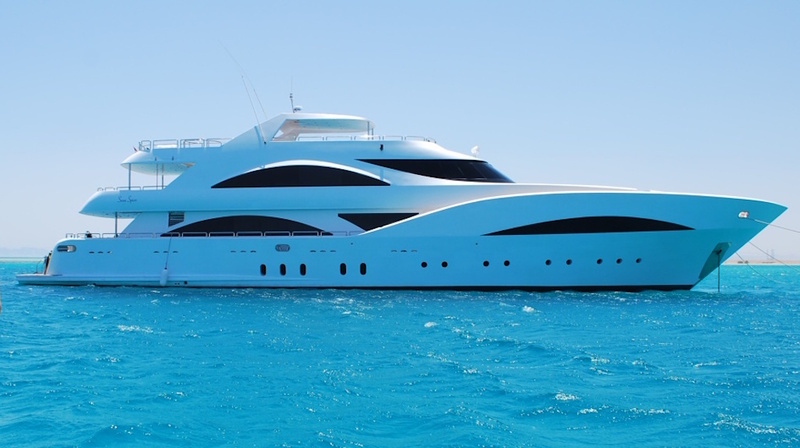 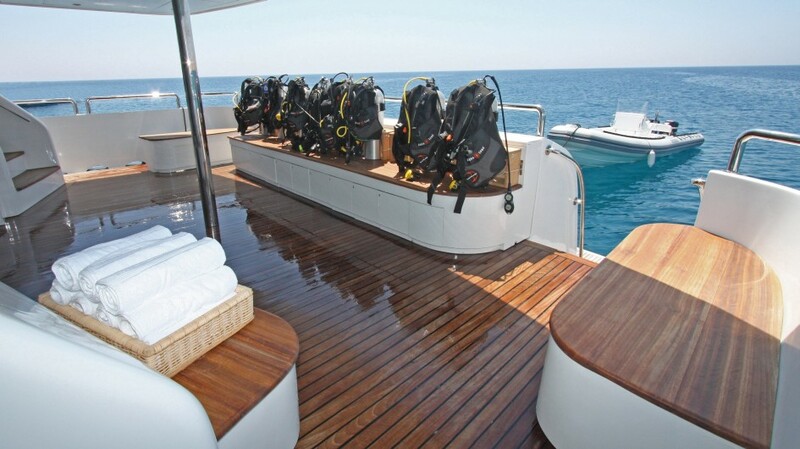 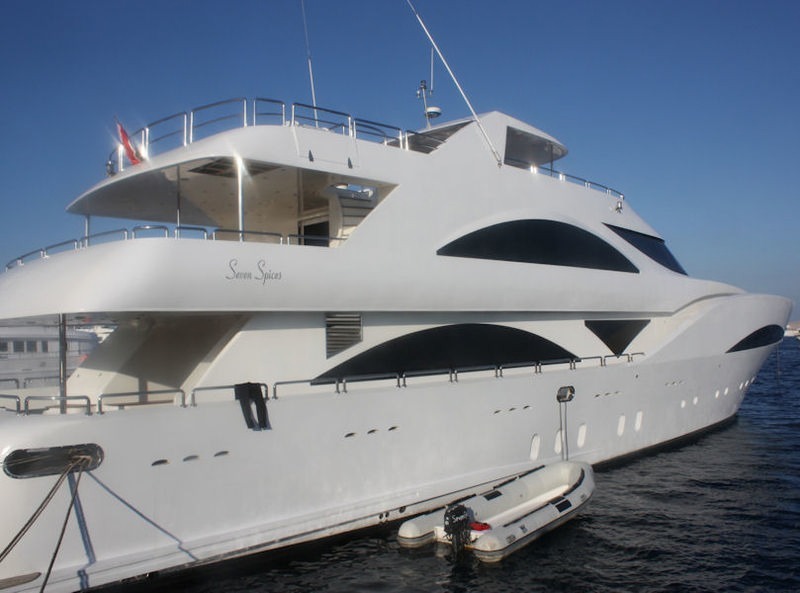 SEVEN SPICES is a perfect charter yacht for those with a passion for scuba diving, kite surfing and other water sports. 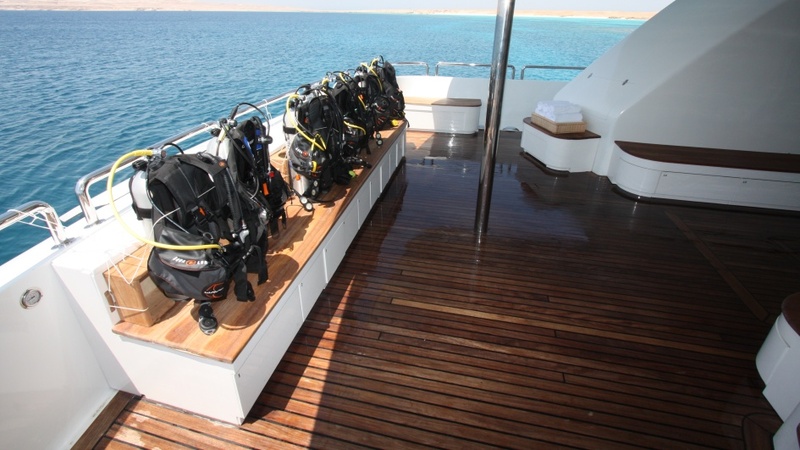 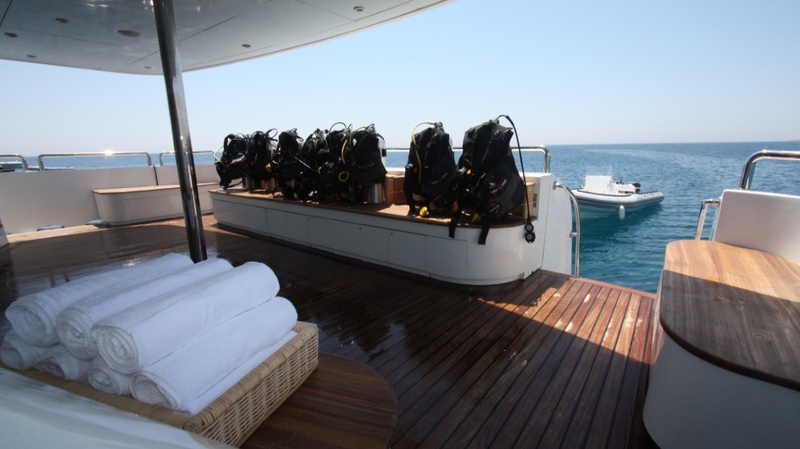 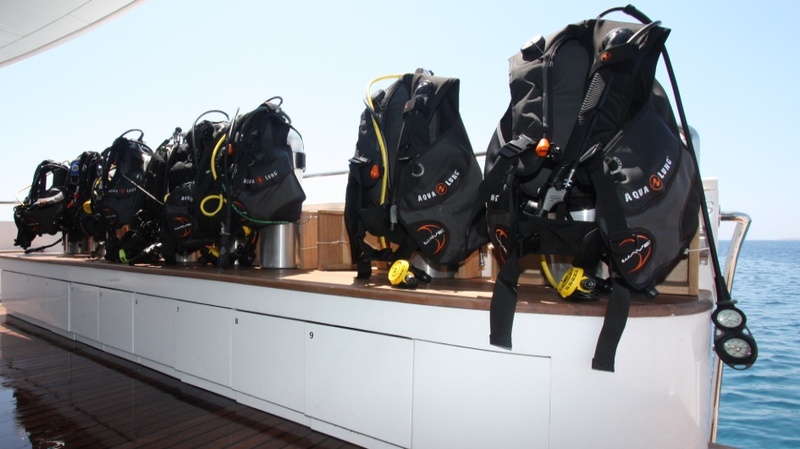 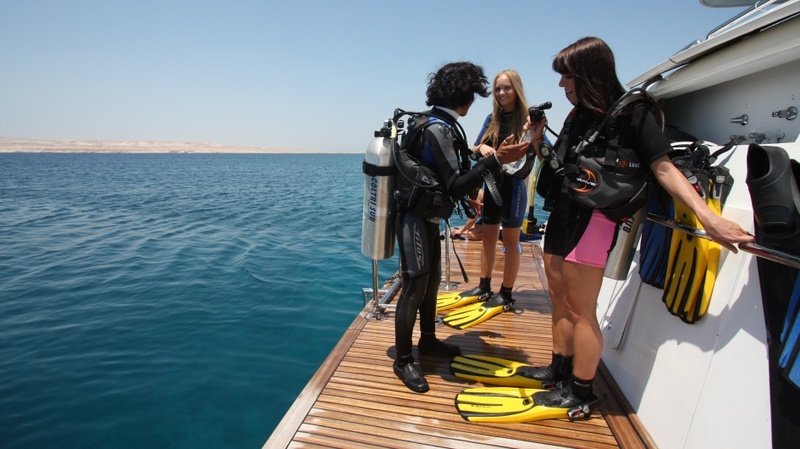 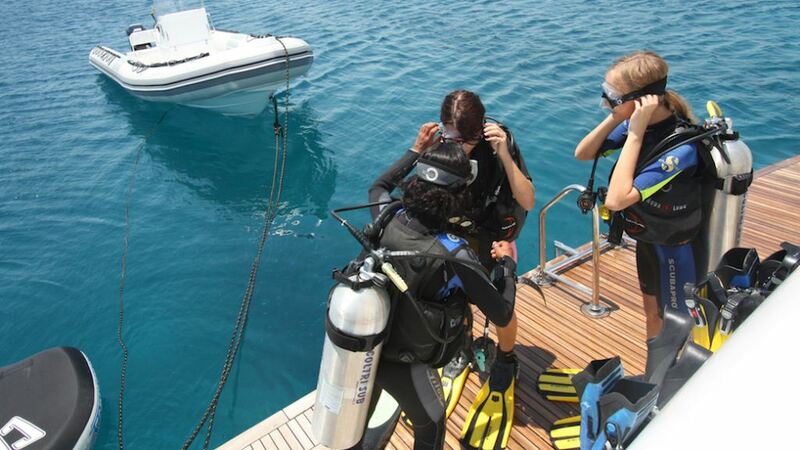 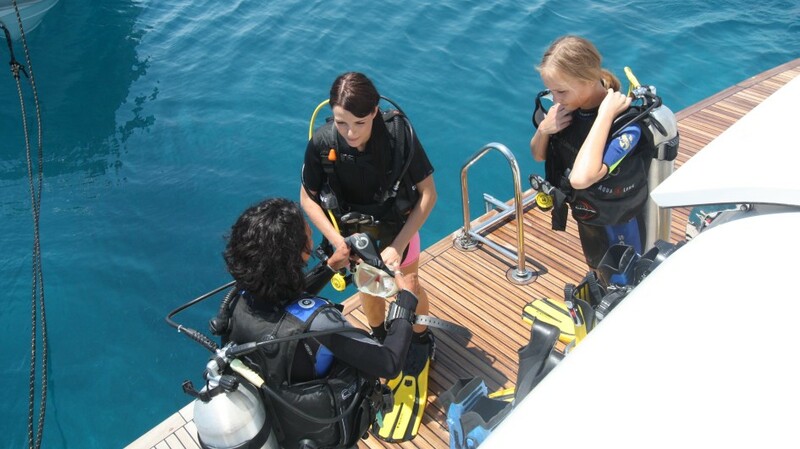 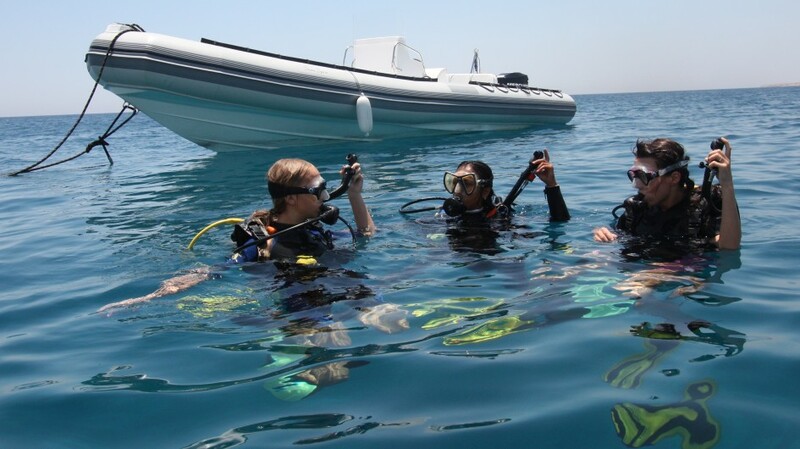 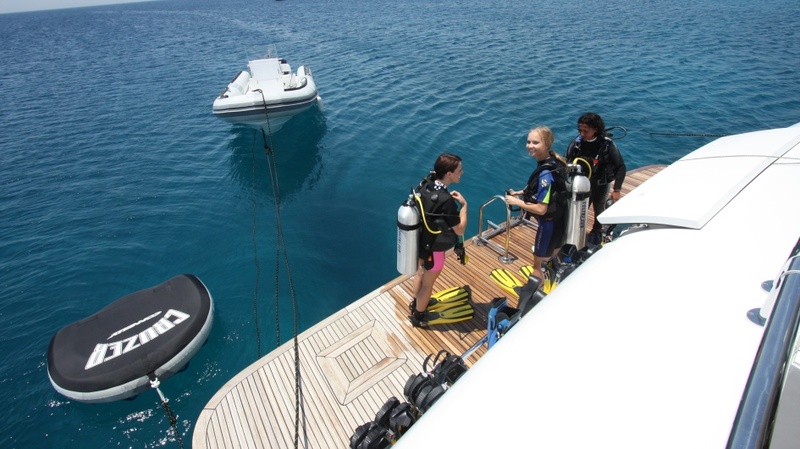 She is fully equipped with the latest scuba diving equipment, from NITROX compressors to BCD's, fins, masks, plus plenty of space and activities for those not wishing to dive. 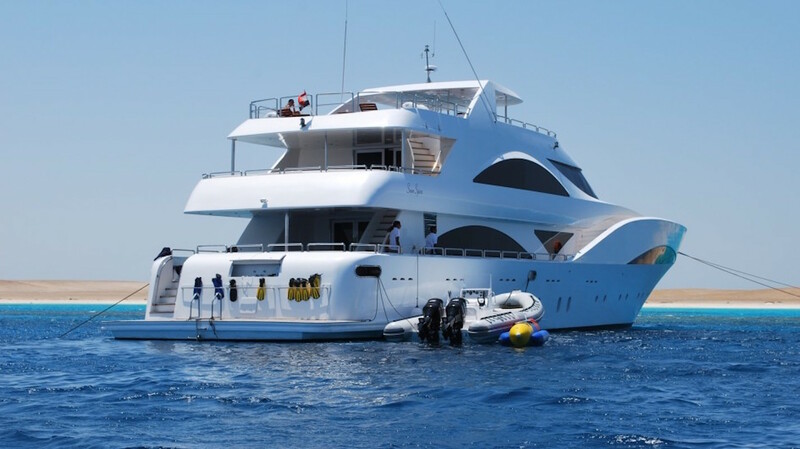 She is also very suitable for kite surfing, deep sea fishing trips, corporate entertainment, family cruises and honeymoons. 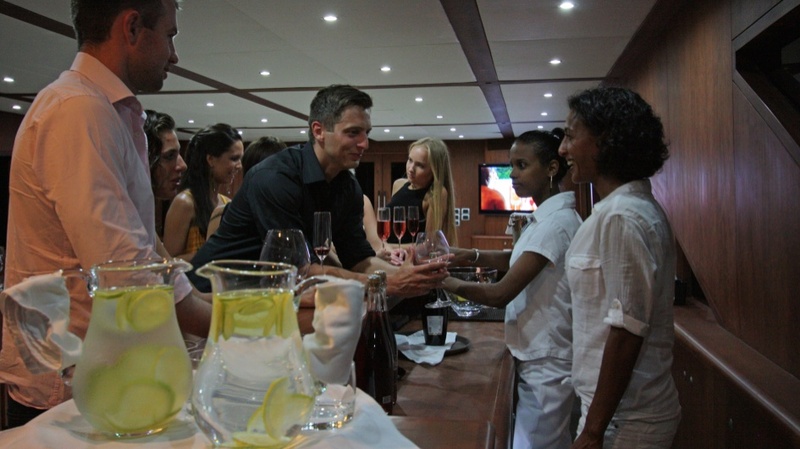 The guests are looked after an international crew of 10. 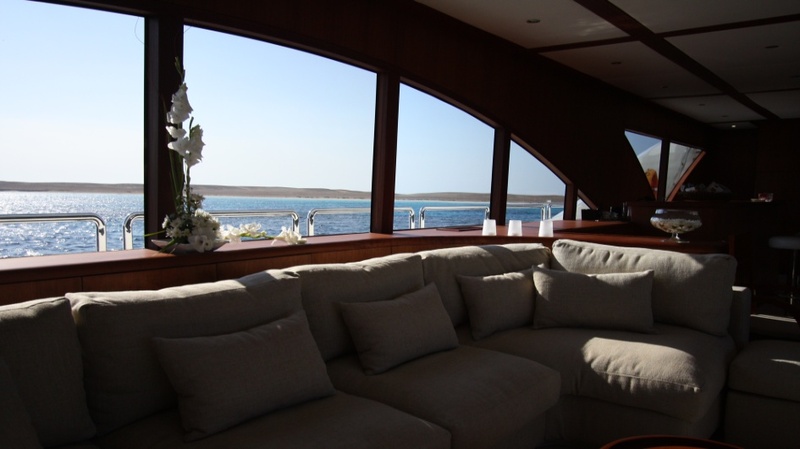 There is a stunning 45m2 full beam Royal Suite with private panoramic views, lounge area with 55'' 3D TV, in room breakfast bar, mini-bar, his & her workstations, separate walk-in dressing room, ultra king-sized double bed and a luxury double basin bathroom. 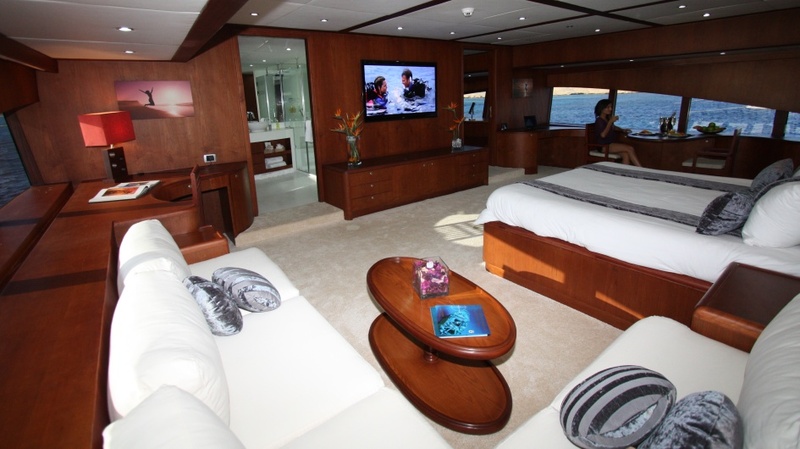 The full beam 40m2 Sky Suite boasts a private lounge and unforgettable sea views, minibar, dressing table, work station, 55'' 3D TV entertainment system and direct access to the sundeck. 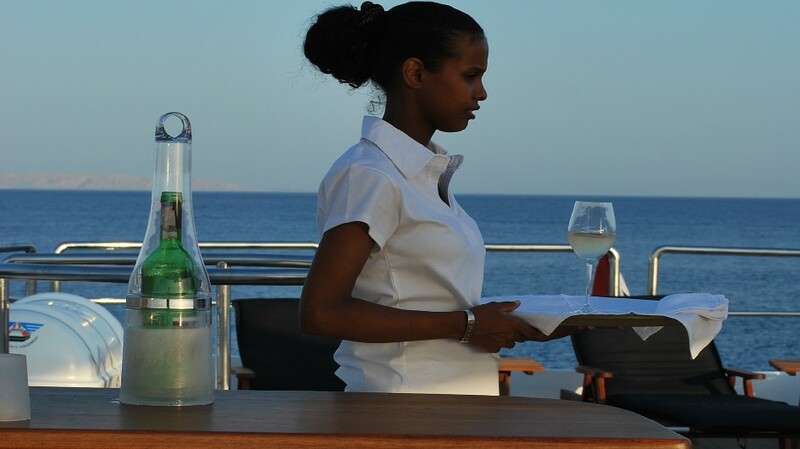 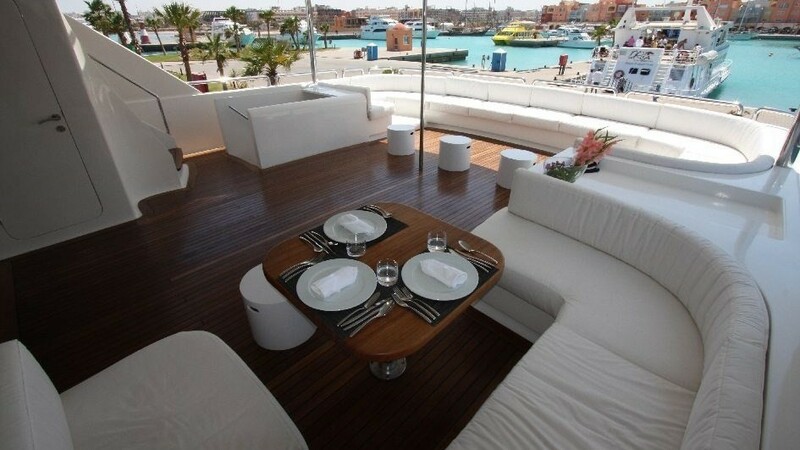 There is also a possibility to dine al-fresco on the sky-deck equipped with Spa Pool, sky bar and sun loungers. 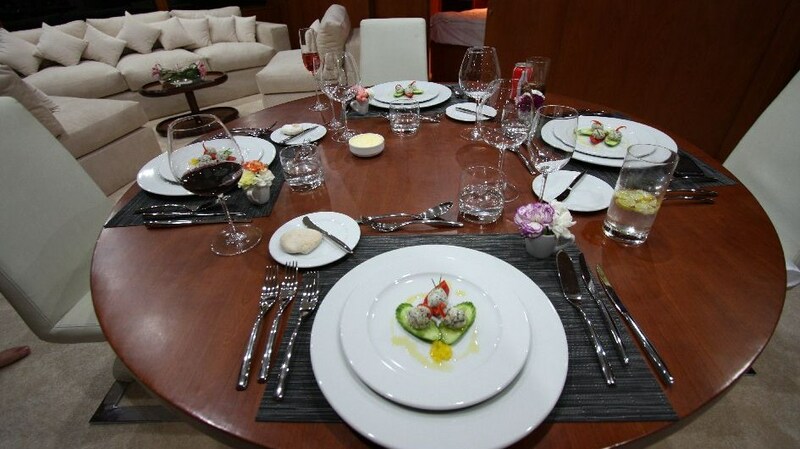 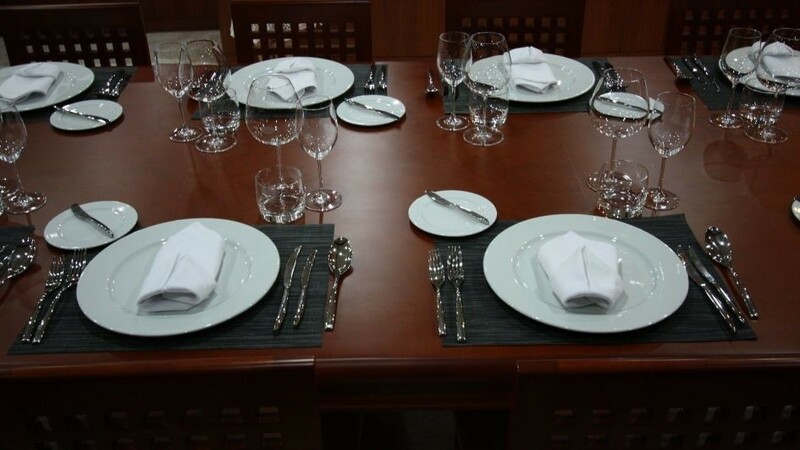 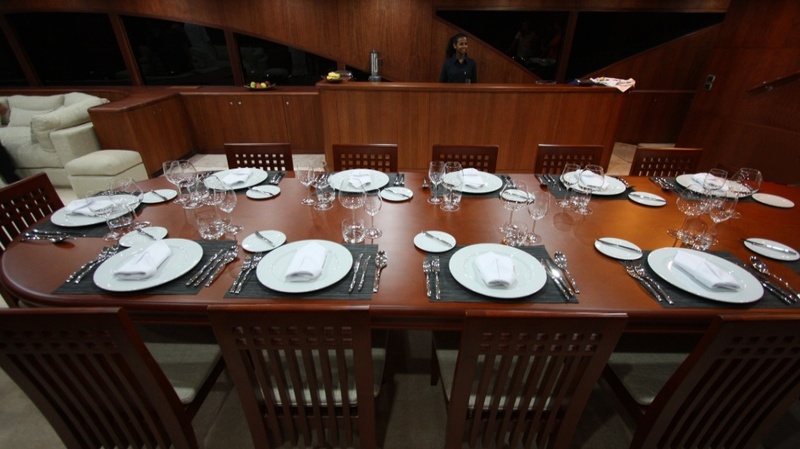 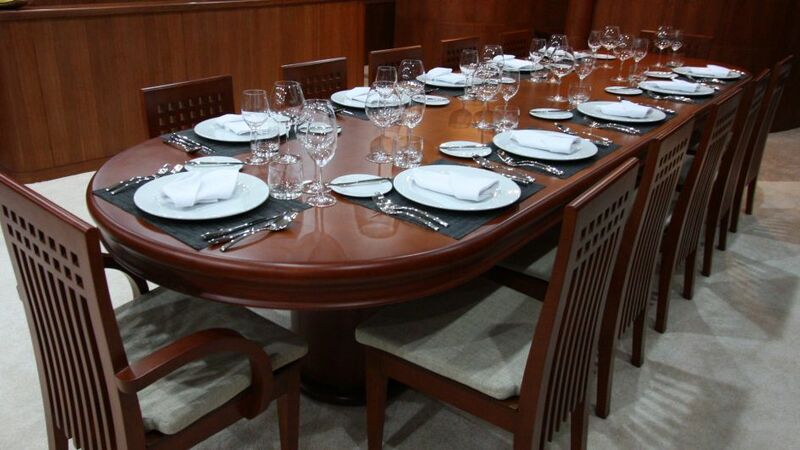 16 guests can be seated at the dining table. 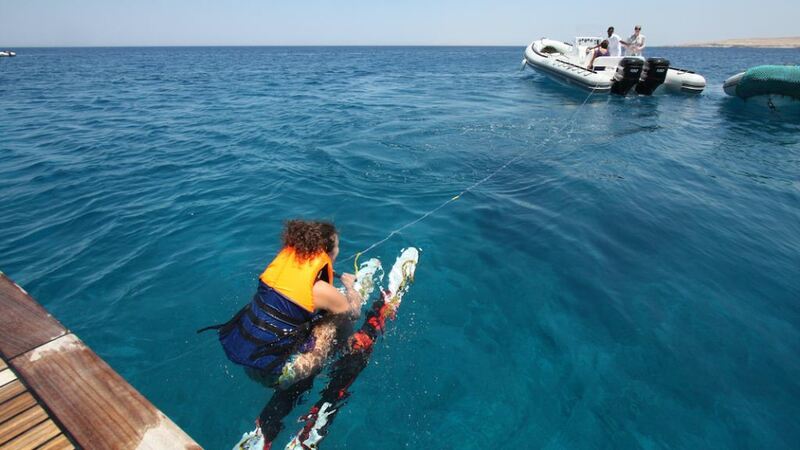 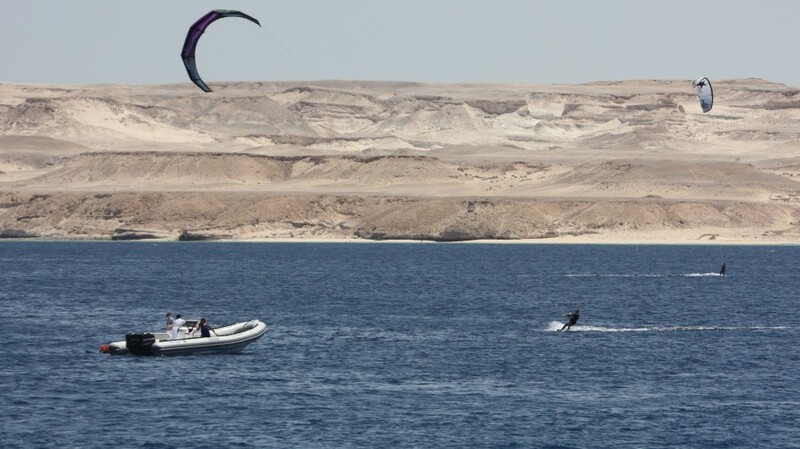 Other fun sports activities include wake boarding, wind surfing, water skiing, towable inflatable rides, underwater video photography as well as other options. 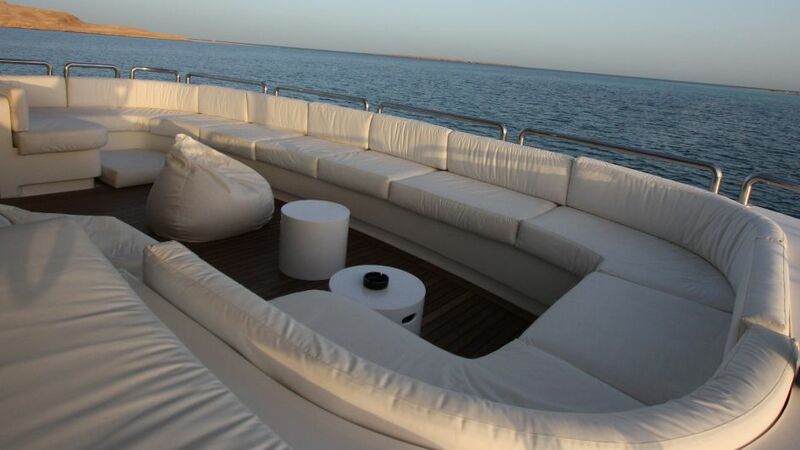 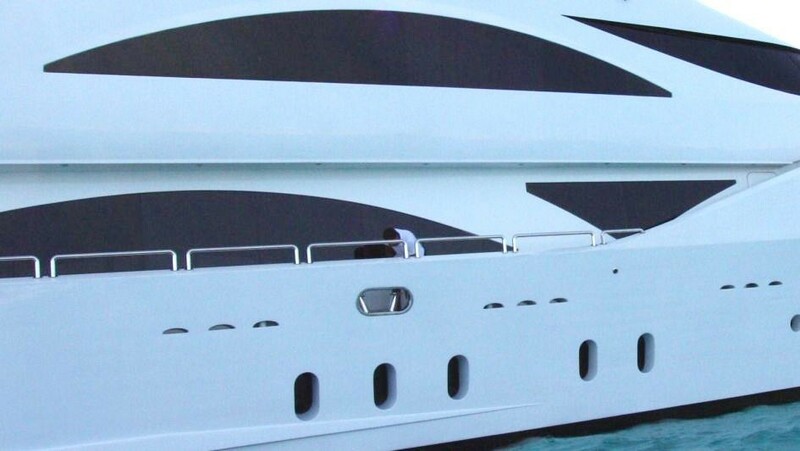 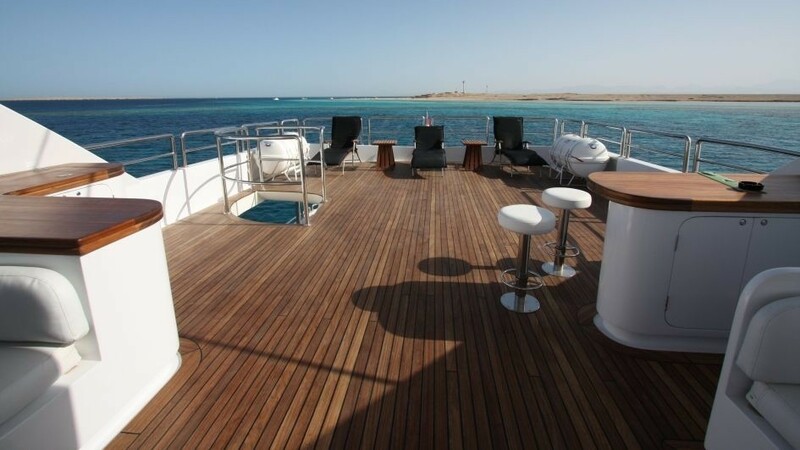 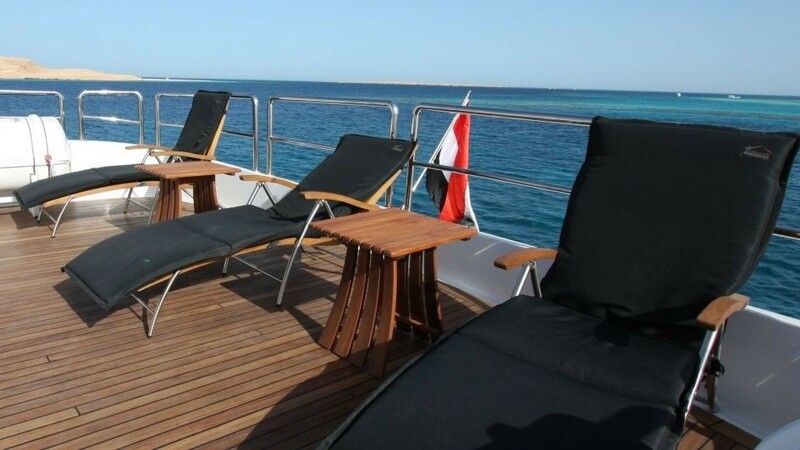 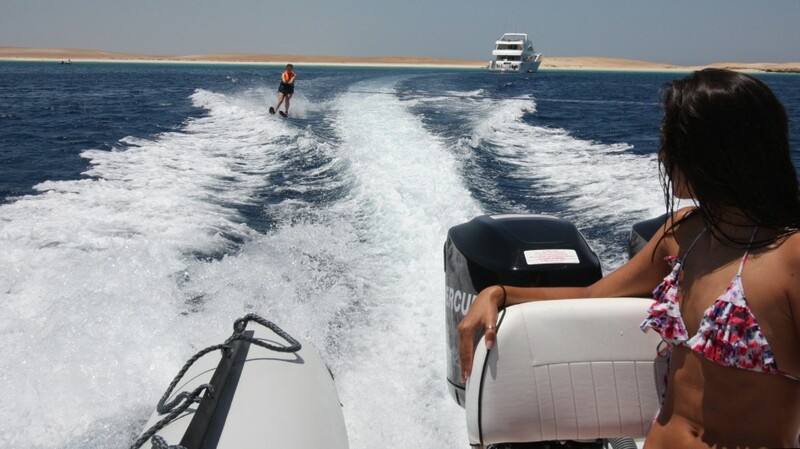 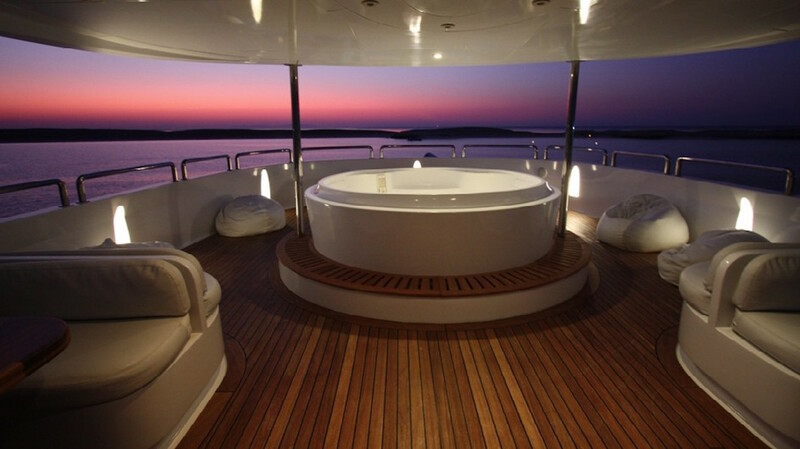 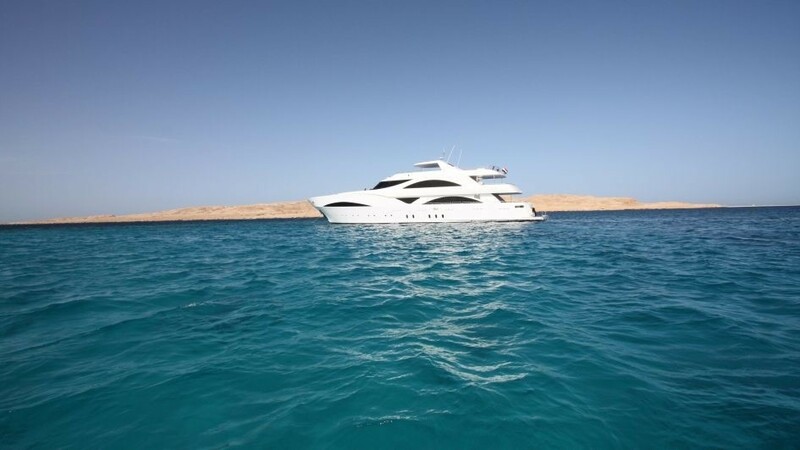 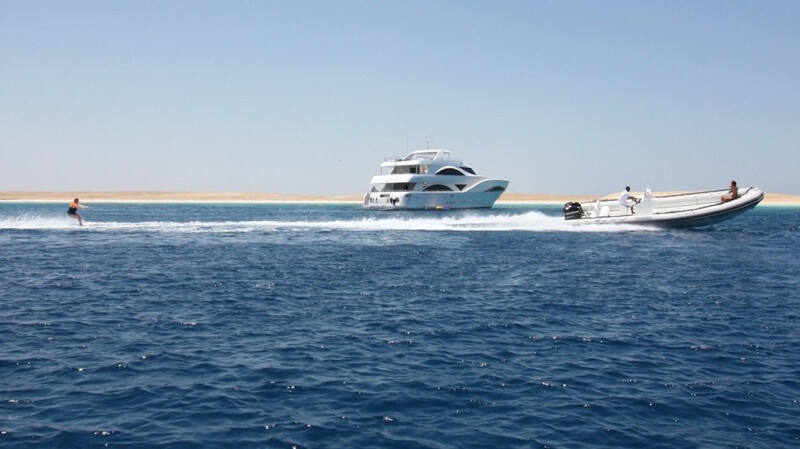 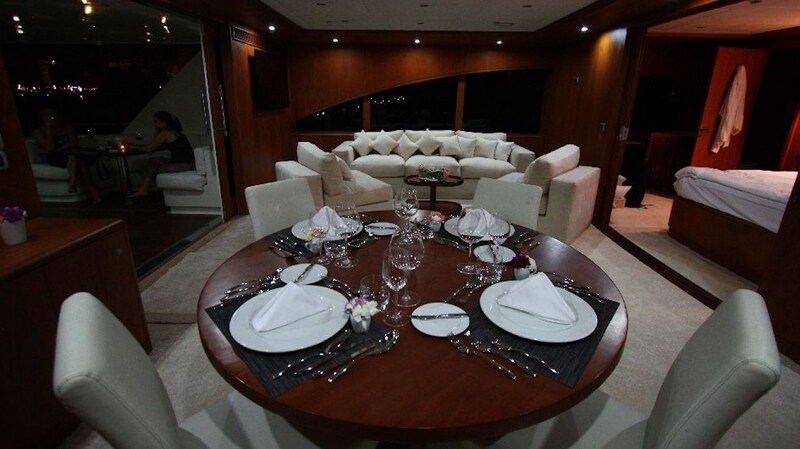 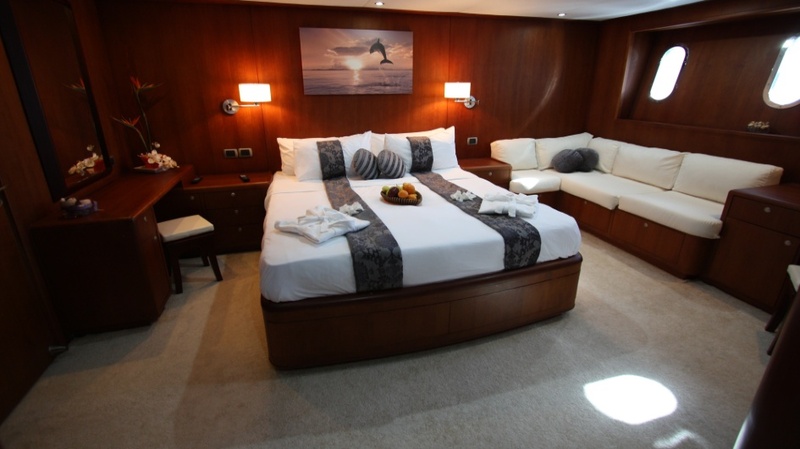 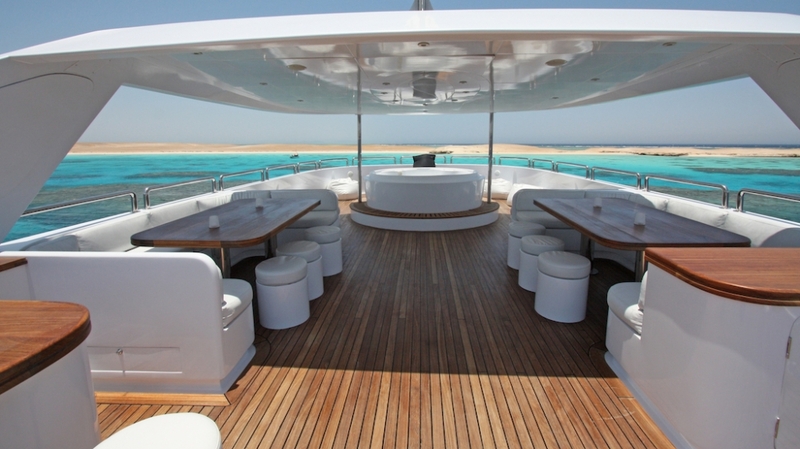 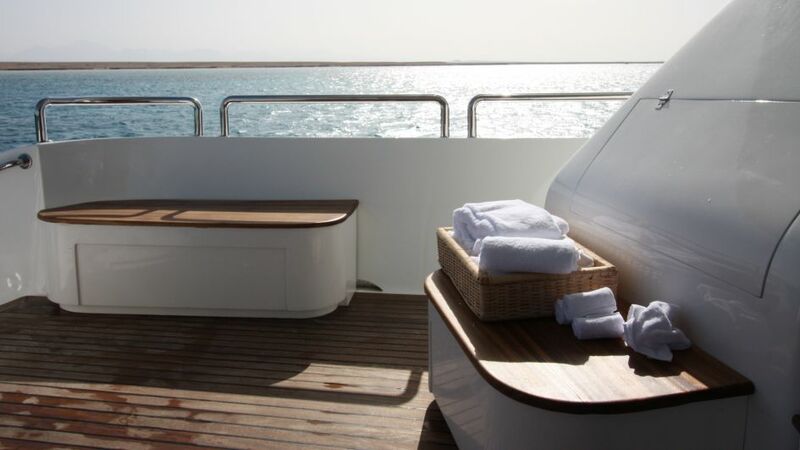 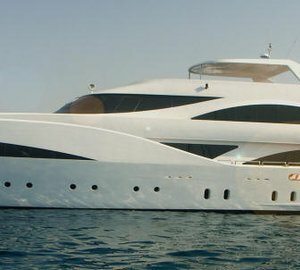 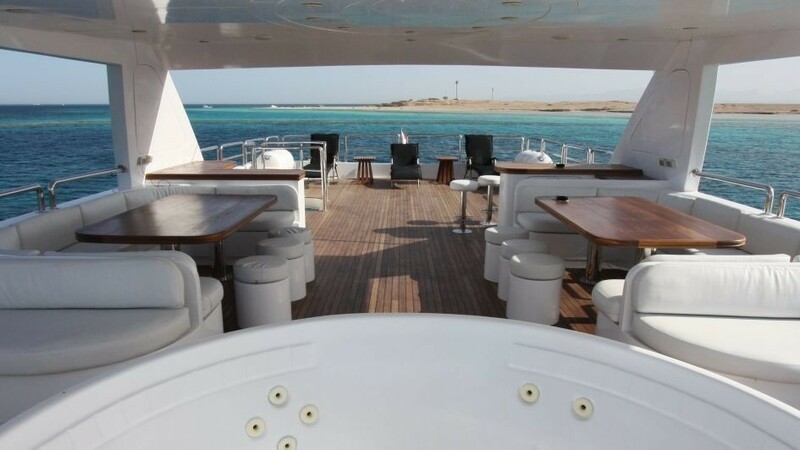 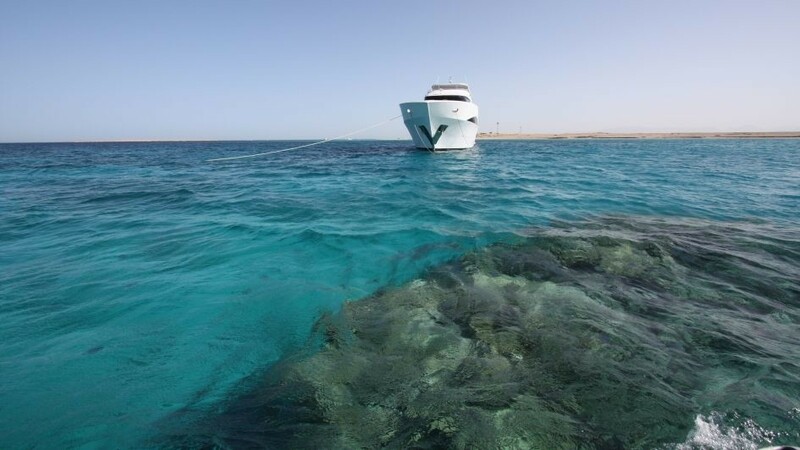 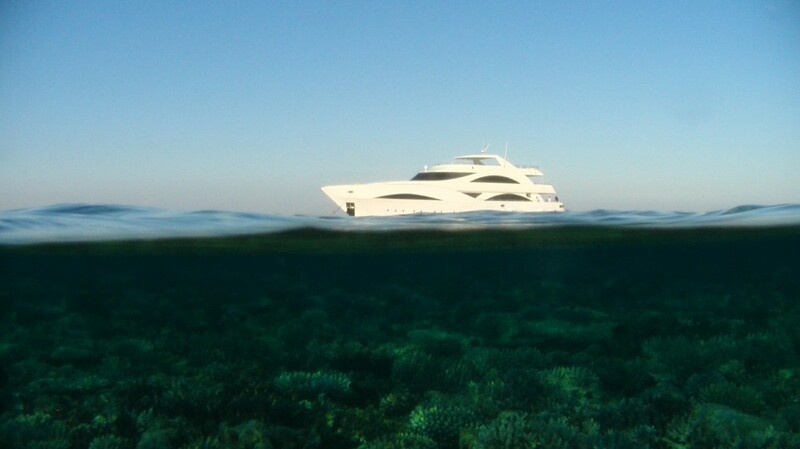 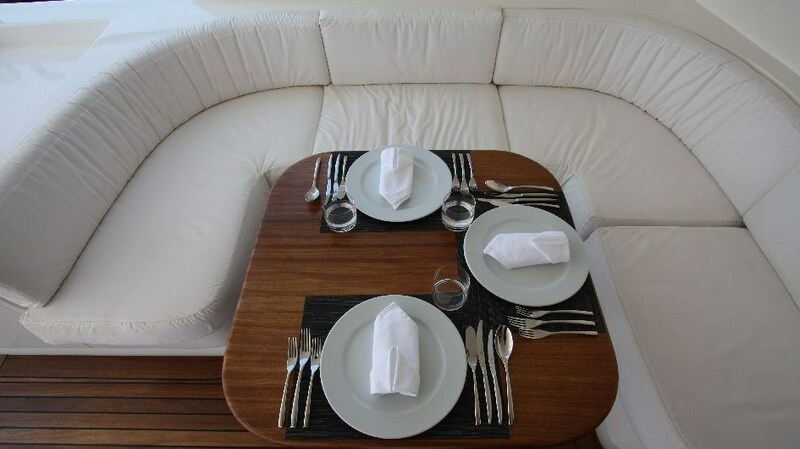 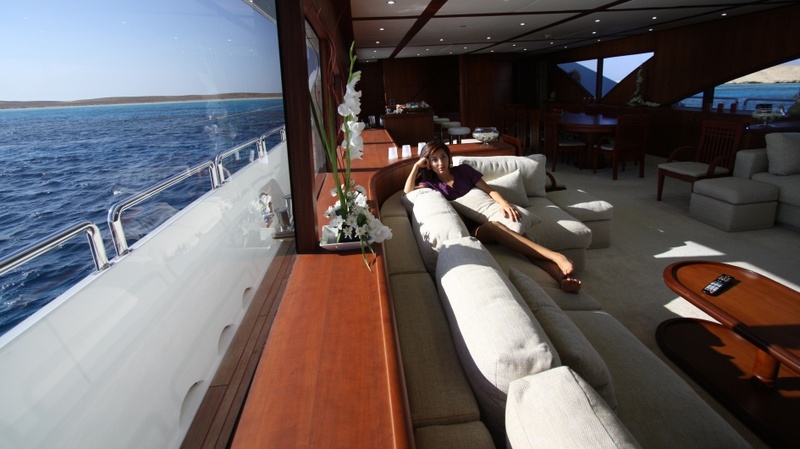 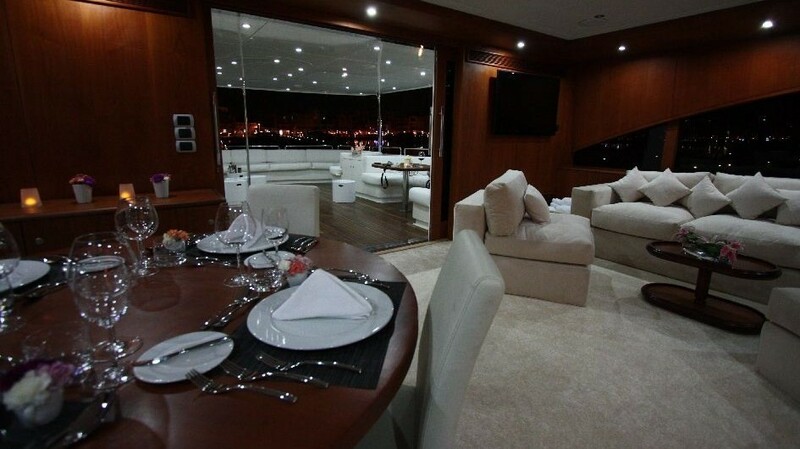 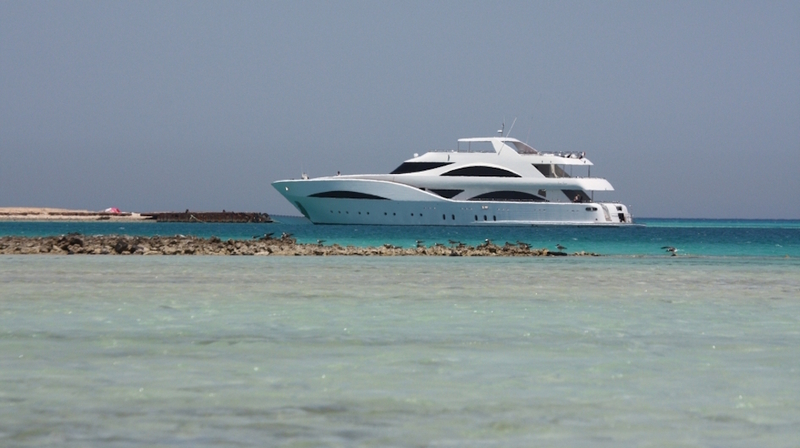 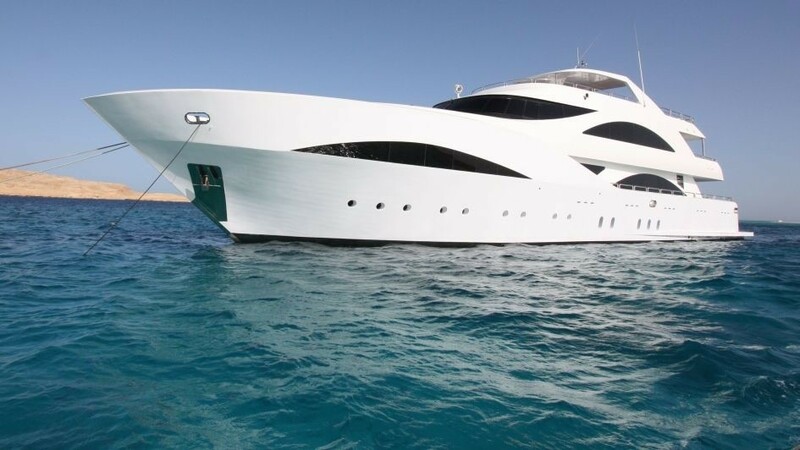 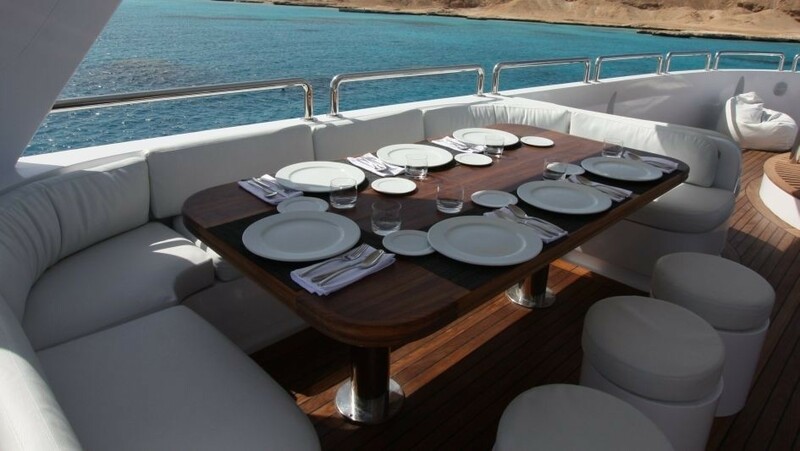 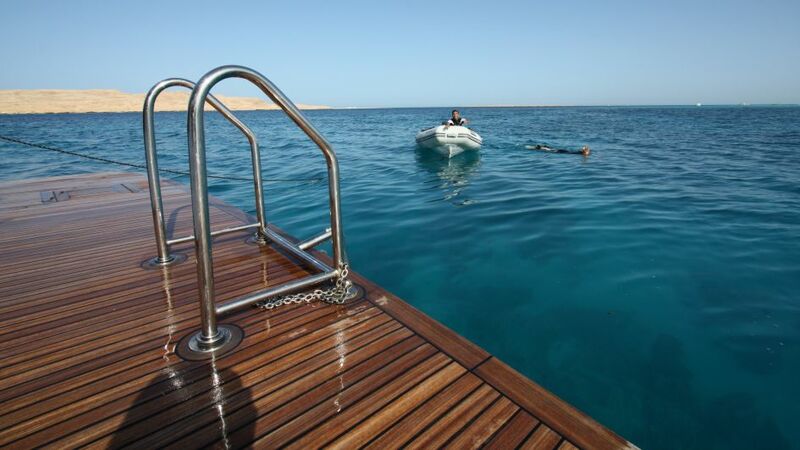 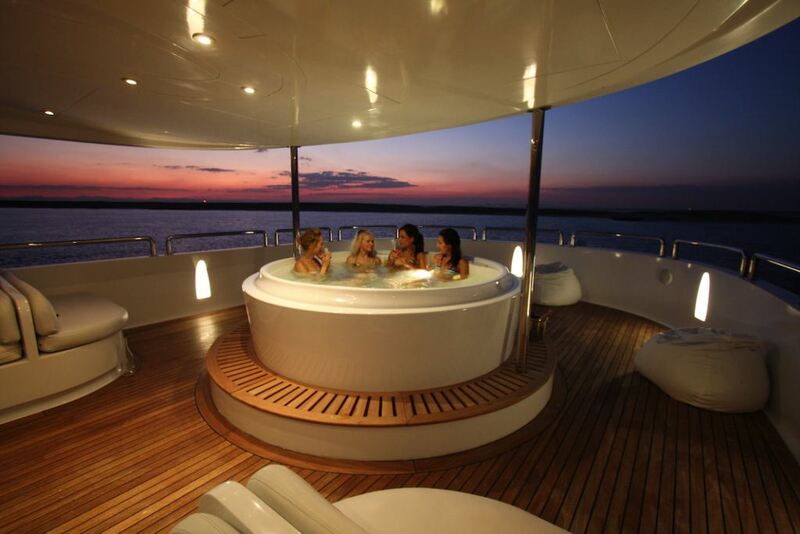 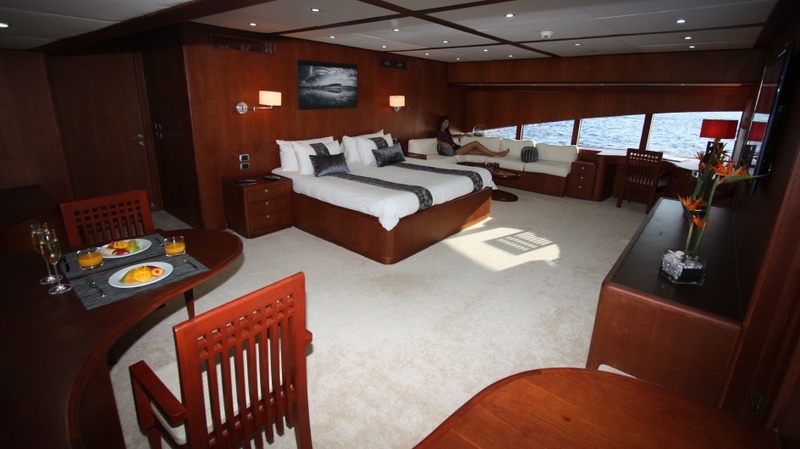 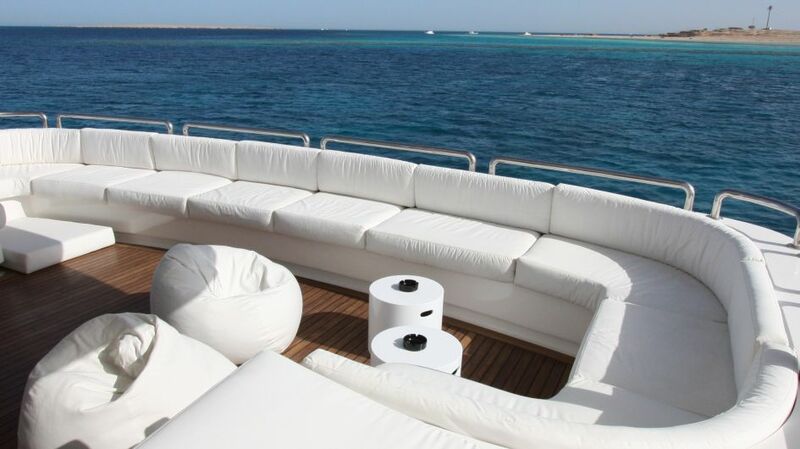 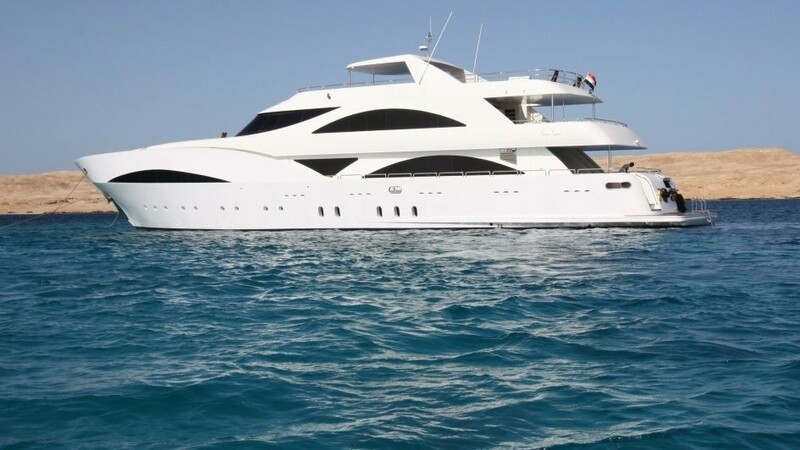 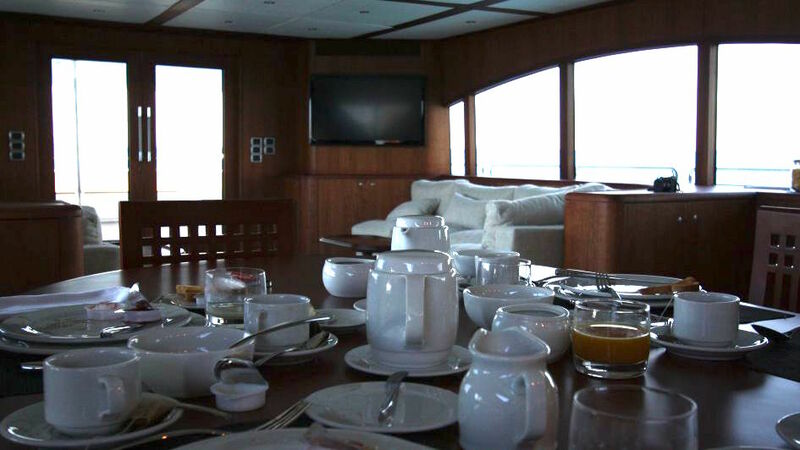 Egypt based motor yacht SEVEN SPICES is able to accommodate up to 13 charter guests in 6 cabins. 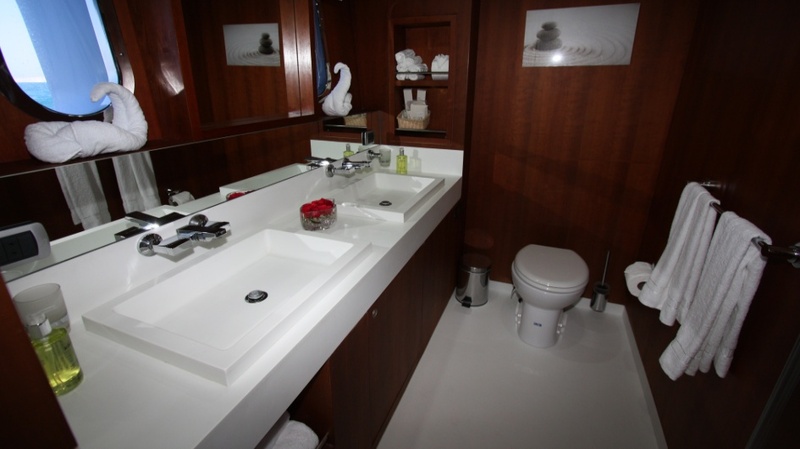 Her Master Suite is 52sq.m. 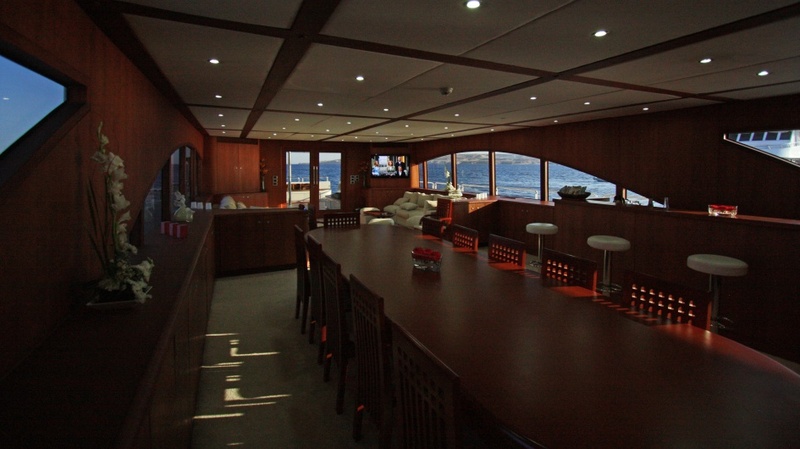 and is located on the main deck. 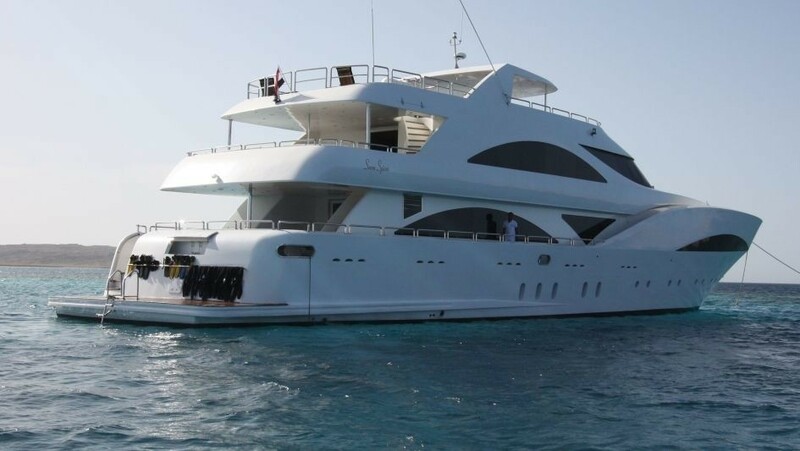 It is full beam with stunning panoramic windows, large walk-in dressing room with, two work-stations, private breakfast bar, 55” 3D flat screen LED TV with video on demand, king-size bed and a sofa, mood-lighting, mini-bar stocked with your preferred drinks, safe (laptop size), wireless internet, modern luxury his & her double basin bathroom stocked with luxury branded toiletries, hair dryer, bath robes. 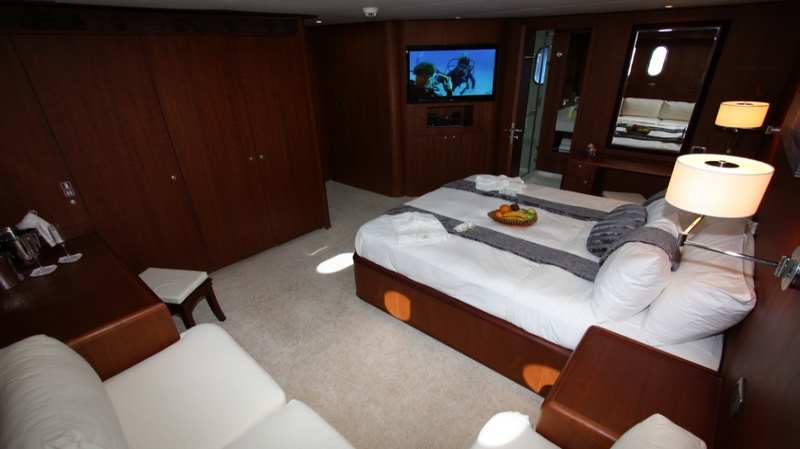 The Sky Suite is 44sq.m, located on the upper deck with elevated panoramic sea views, queen size double bed with separate private living room and direct access to the sun-deck, dressing table, private dining table seating 4, comfortable lounge seating for 5, large 47” 3D flat screen TV with on demand movies, separate 32” flat screen TV in bedroom, mood-lighting, separate 4 speaker sound system with pre-loaded iPod, mini-bar stocked with your preferred drinks, safe (laptop size), wireless internet, luxury double basin his & her bathroom stocked with luxury branded toiletries. 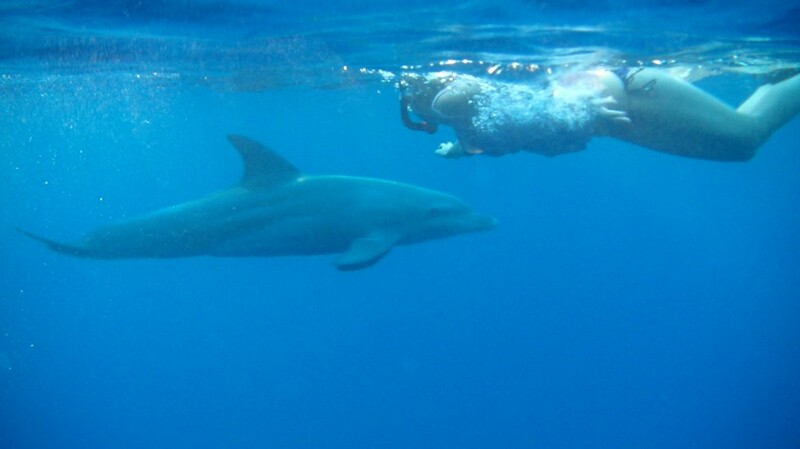 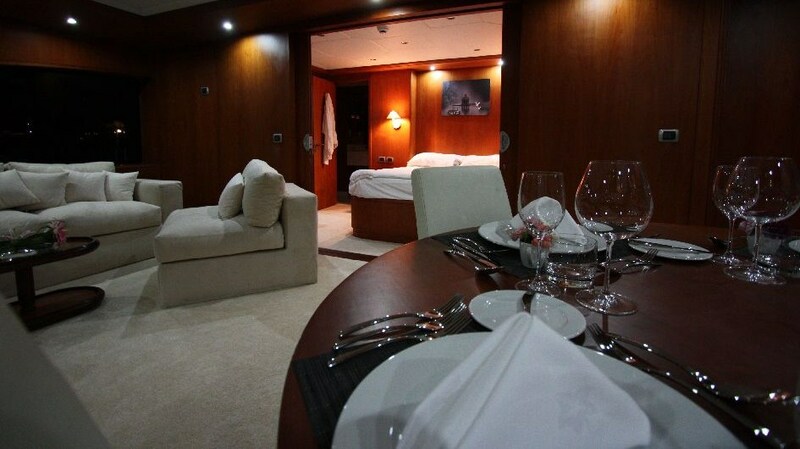 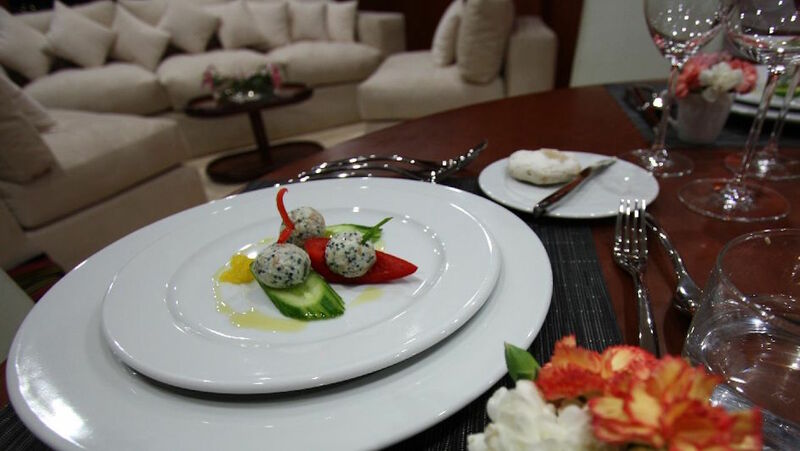 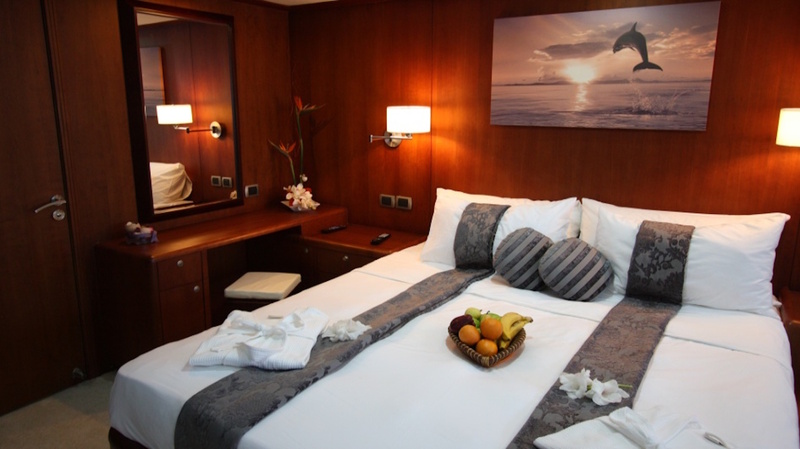 The Dolphin Suite is 25sq.m and situated on the lower deck. 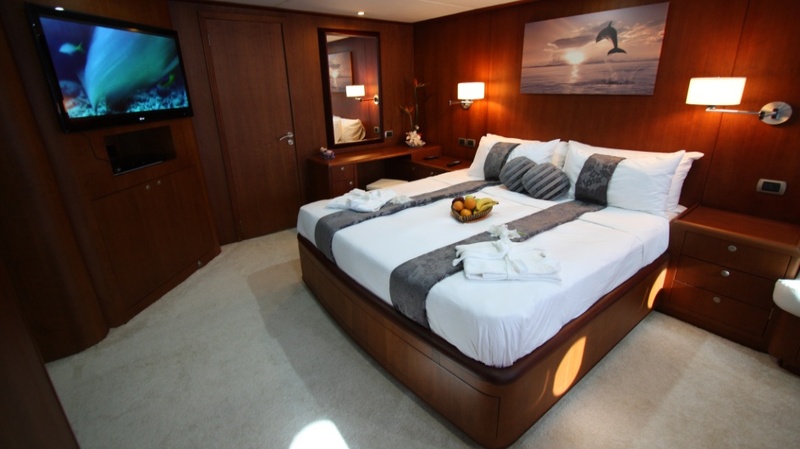 It is full-beam with a king sized double bed, comfortable seating area, 42” flat screen TV with on demand movies, work station, dressing table, mood lighting, mini-bar pre stocked with your preferred drinks, safe (laptop size), wireless internet, luxury double basin bathroom stocked with luxury branded toiletries. 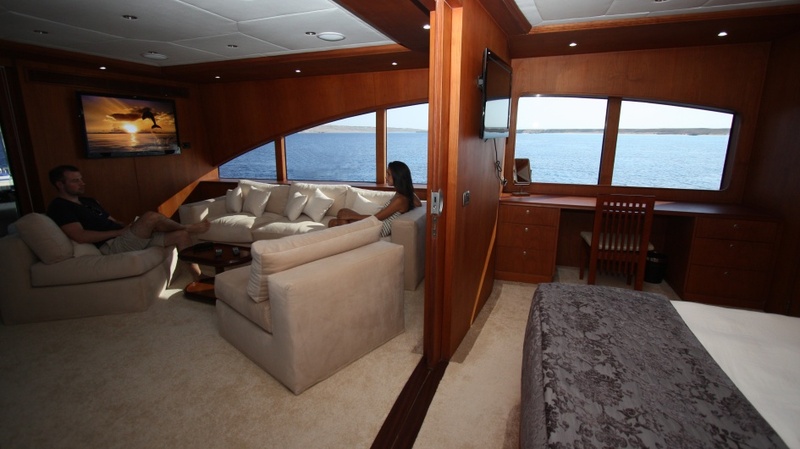 The Double Cabin is 12sq.m. 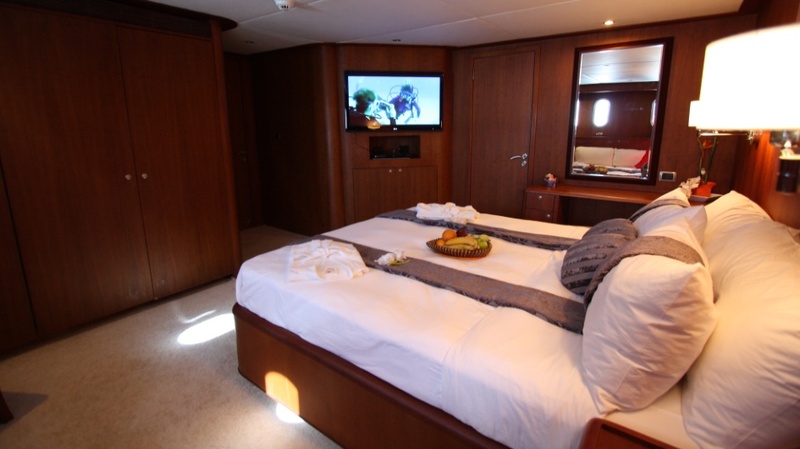 (lower deck) with a queen-size double bed, small dressing table, 26” flat screen TV with on demand movies, luxury single basin bathroom stocked with luxury branded toiletries, safe, wireless internet. 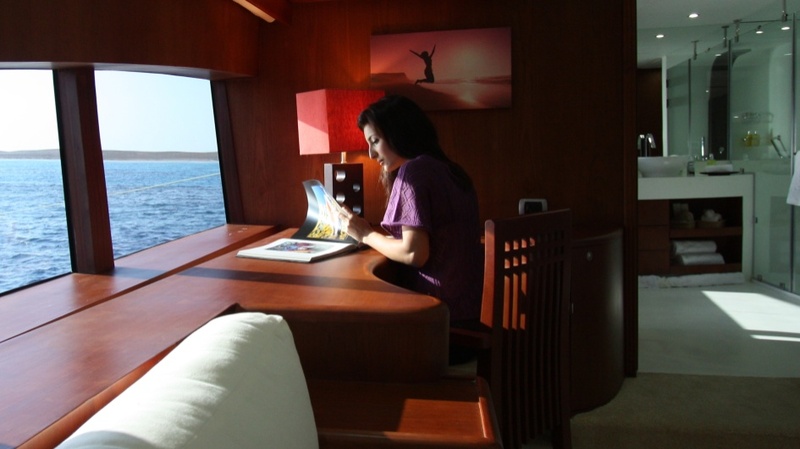 The Twin Cabin is 14sq.m. 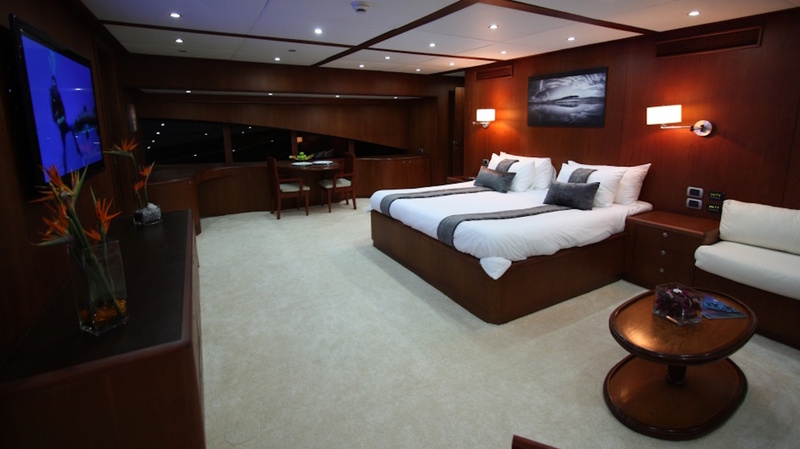 (lower deck) with two single beds, small dressing table, 32” flat screen TV with on demand movies, luxury double basin bathroom stocked with luxury branded toiletries, safe, wireless internet. 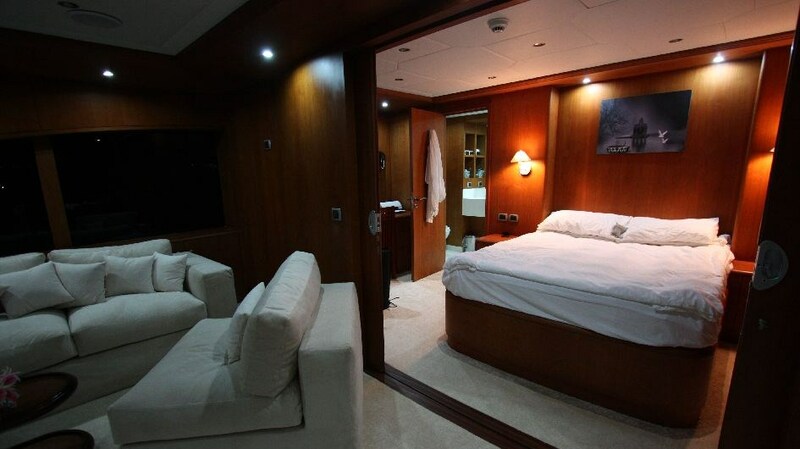 The Triple Cabin is 15sq.m (lower deck) and has a double bunk-bed with a separate single bed which can be used either as a bed or sofa, small dressing table, 32” flat screen TV with on demand movies, luxury single basin bathroom stocked with luxury branded toiletries, safe, wireless internet. 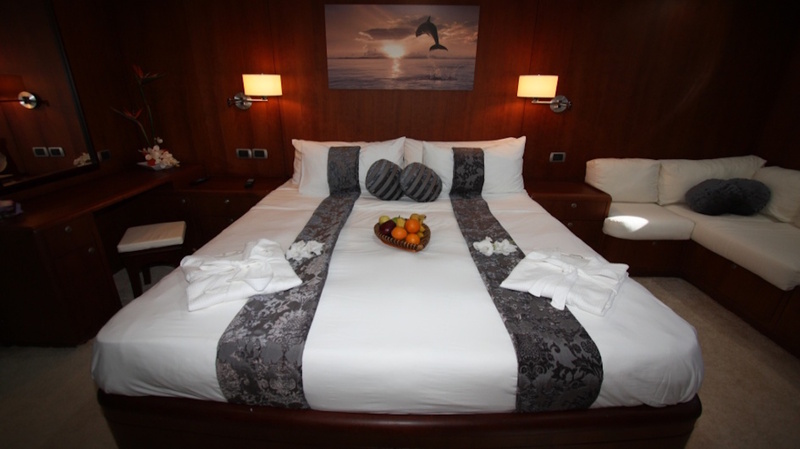 All suites have individually controlled quiet marine Air conditioning units, separate fresh air supply, Wireless Internet, hair dryer, fine Egyptian cotton linen, luxury Egyptian cotton towels, personalised Egyptian cotton beach robes, orthopaedic mattresses, luxury branded toiletries. 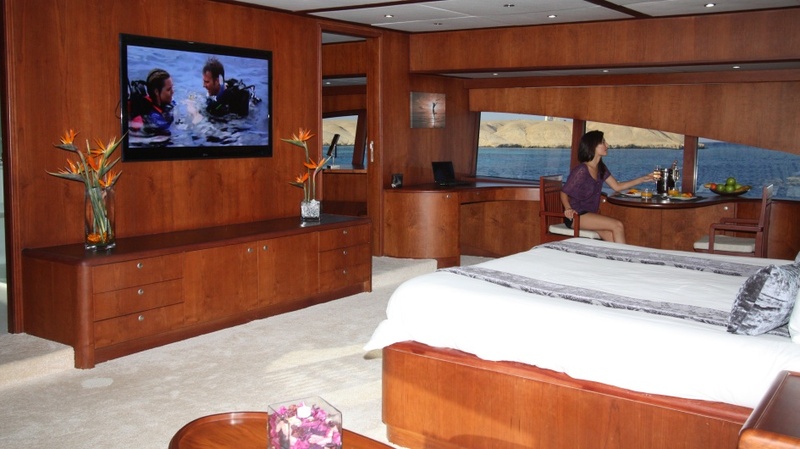 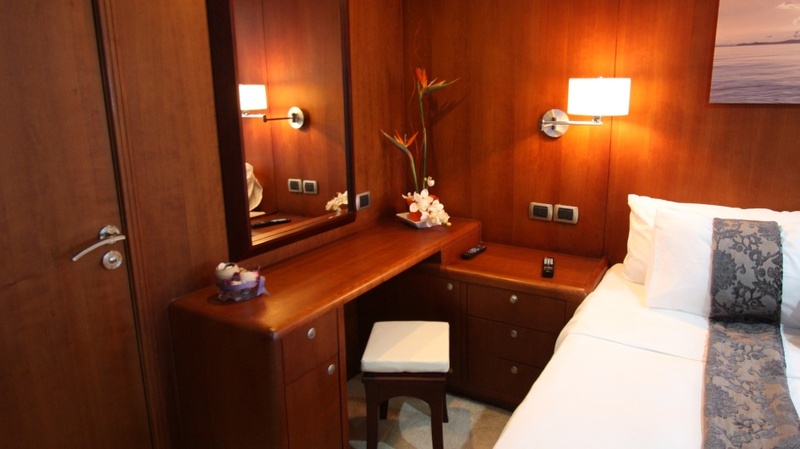 The 3 ultra-deluxe full beam suites also have personally stocked mini bars and fruit bowls. 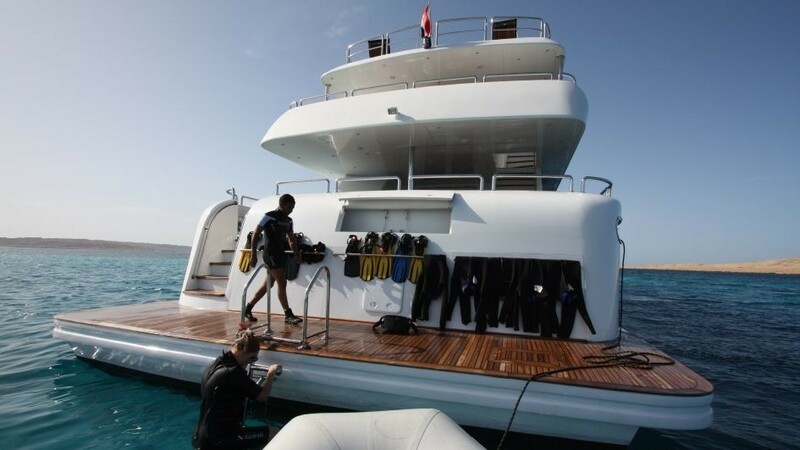 Charter yacht SEVEN SPICES has the following Water Sports Equipment: Scuba Diving & Snorkeling; All scuba diving equipment for 13 guests & 2 dive guides/instructors, Aqualung BCD of various sizes (20 in total), Mares diving suites ranging in size from XXS to XXXL (25 in total), 16 sets of octopus, first & second stage, air/depth consoles, 12 litre aluminium tanks X 16, Soft weights for maximum comfort (250kg in total of various weight sizes), 20 pairs of high quality branded masks to suit various face sizes, plus 20 snorkels (aqualung & colitrisub), Choice of air or Nitrox (2 hand-held Nitrox analysers), Underwater rechargeable torches for night dives X 6, Branded Dive boots (mares) and open back fins for maximum comfort available in all sizes (26 pairs of each in total), Children's easy slip-on backed fins, 4 X 10 litre oxygen tanks, 4 X Dive Computers, 2 X Second stage mouth piece for photographers (avoids air bubbles in the picture), HD wide-screen video camera with underwater housing and lights Wind Sports Kite Surfing; Five training kites, Four branded Kite boards of different size (North & Underground), Five ‘North’ branded Kites to cater for different wind conditions and skills. 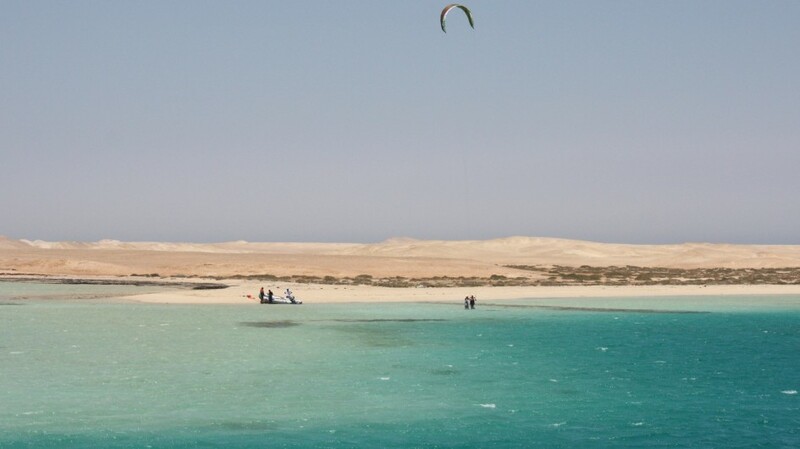 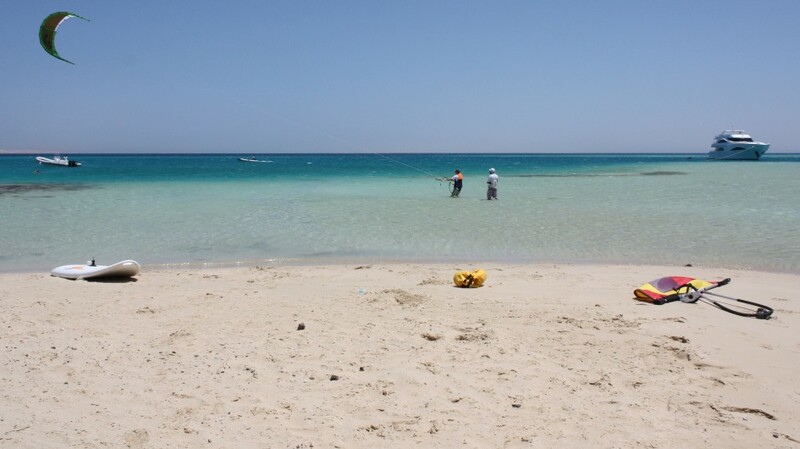 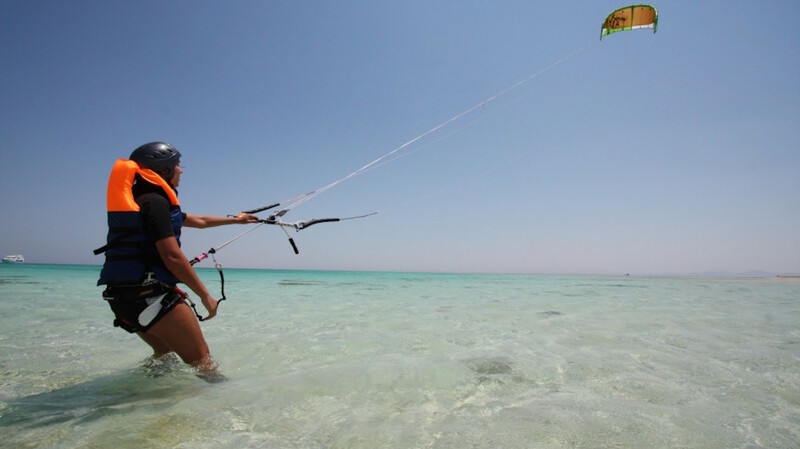 Sizes: 5m, 7m (25+ knot winds , 9m(16 to 25 knot wind) and 12m (12 to 18 knot winds), Five Kite surfing bars and harnesses Wind Surfing; Two top branded Wind Surfing boards suitable for beginners, Three sized sails to suit various wind conditions and skills. 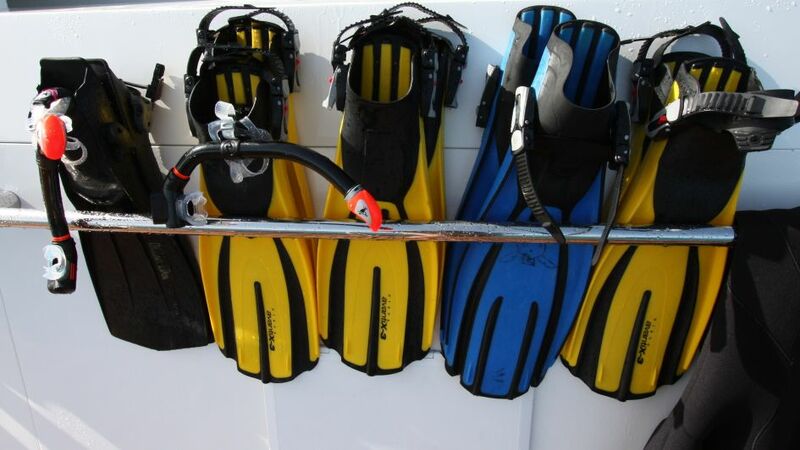 Sizes: 5.5m, 6.5m and 7m. 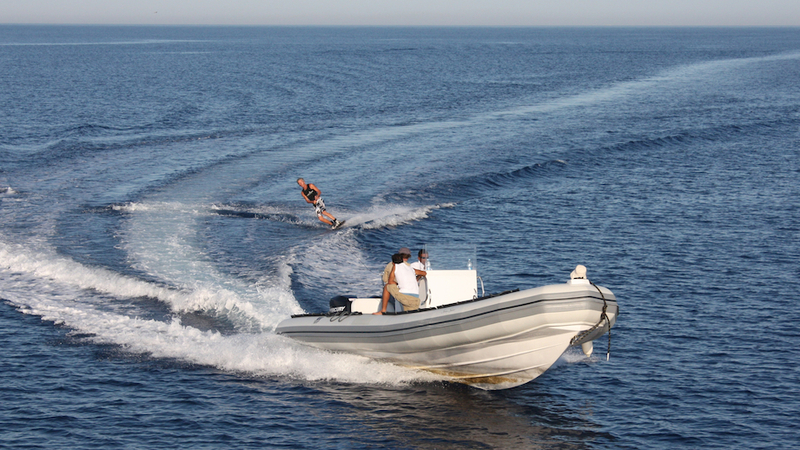 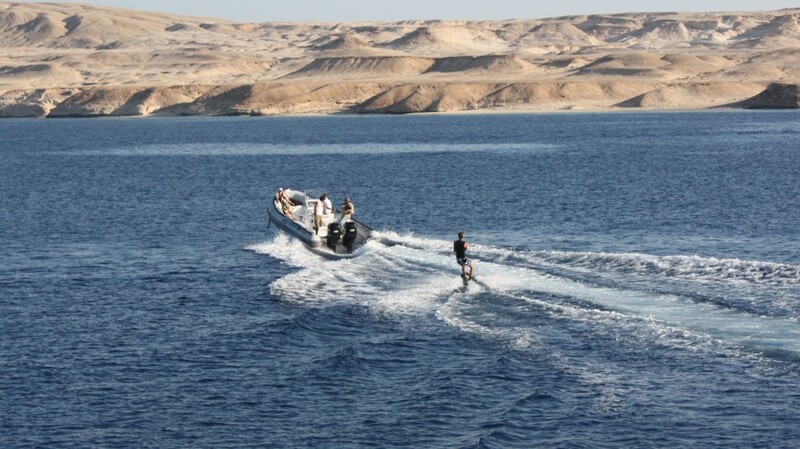 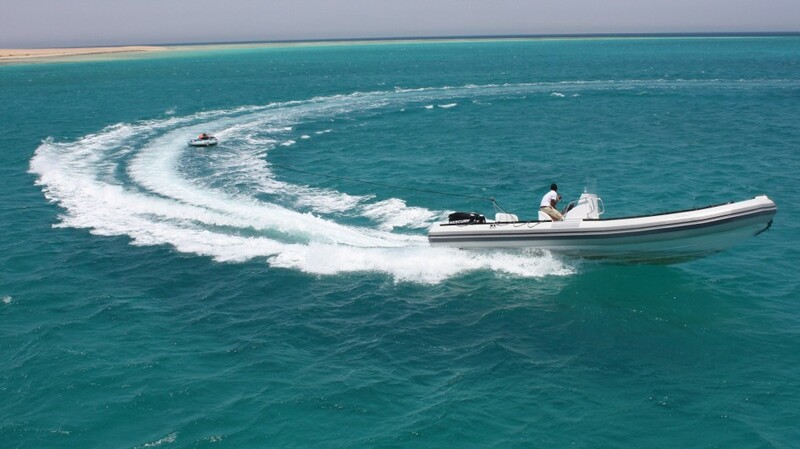 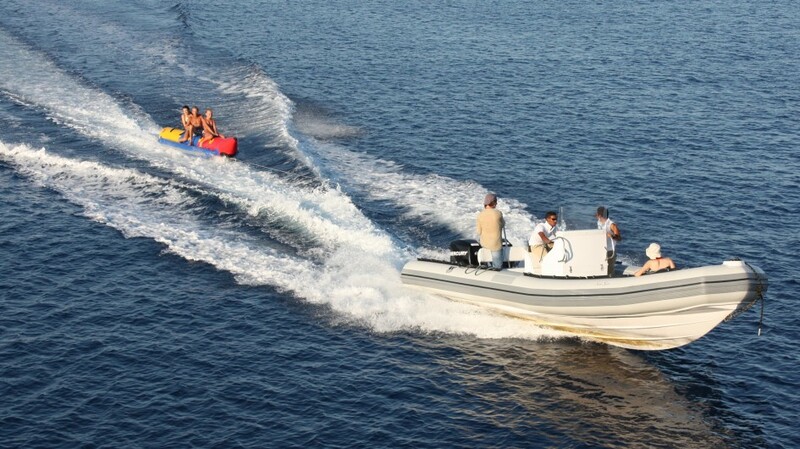 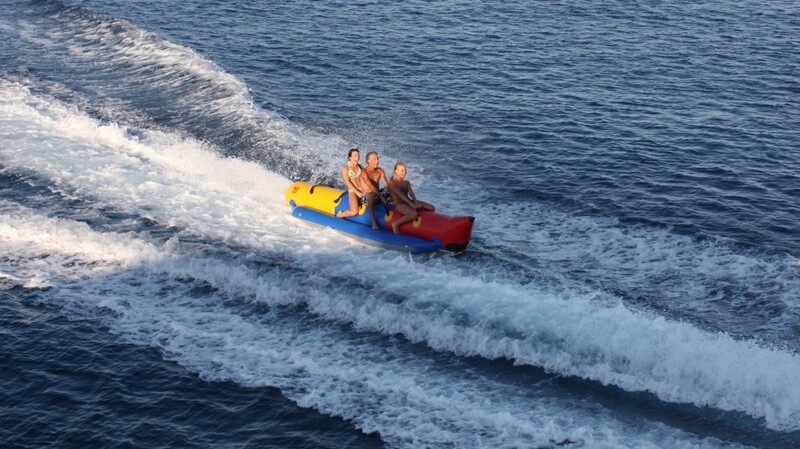 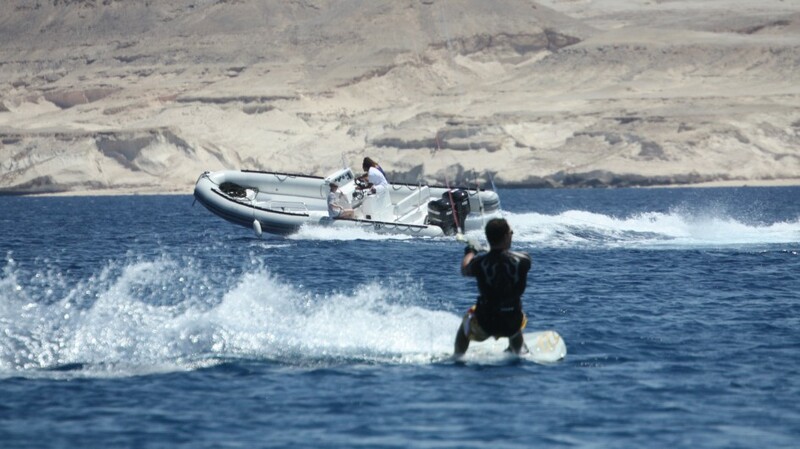 Power Sports; RIB Speed boat -Large 8.5 meter RIB with 2x150HP engines, Water Skiing – Water skis to suite various feet sizes, Wake Boarding – 2 wake boards to suit various feet sizes, Banana Boat – 5 Seat inflatable banana boat for riding the waves.